I liked Dean breaking out the Mousetrap, I am sad that it wasn't "that" kind of Game Night after all. It's been long enough since this episode aired that my impressions have gotten kind of fuzzy already. I do remember wondering if Mary was going to die because they seemed to be having an awful lot of "moments" with her and the boys. They were really telegraphing their punches there. I was surprised to see Jo back, and as kind of a good guy now. The last time we saw her, wasn't she having a falling out with Lucifer in heaven? That whole plot just seemed to end without a lot of closure. Jack clearly seems off but he still doesn't seem evil or even that different really. It's more like he's having issues with impulse control. He took a little too long frying Nick but he had a fair point that Nick was really, really bad and Nick was in the middle of bringing Lucifer back. I'm not sure if Nick is gone for good but I suspect that Mary's not. More likely Jack just wished her off to the cornfield someplace. But we shall see. Lucifer is definitely coming back, and I imagine that the Inky Entity will have something to say about that. It's looking like Michael really is dead. What a weird arc that character had. He wasn't scary for the longest time, then he got really scary in a hurry, then he got offed by Jack like it was nothing and Dean didn't even have to go in the box under the sea! This season has been all over the place, and since they've only got a few episodes left I'm not sure if they have time to make sense of all this. I'm still wondering what happened to Garth and Kaia and alt-Charlie and alt-Bobby and Ketch. One interesting thing we saw in the episode before this one was that Cas apparently lives at the bunker now. I always wondered why he didn't and where he was and what he was doing when he wasn't there (which seemed to be most of the time.) But the way Sam and Dean talked about him having left last time, it was clear that they saw it as unexpected. Yeah, I'm finding this season exasperating. It's just a bunch of random stuff happening, or seeming like it's going to happen and then not happening. It seems like with both this season and the previous season, the overall story arc has been really muddled, but this season is definitely doing an even worse job than the previous one. I really hope that both Nick and Lucifer are gone for good. Unfortunately, the show seems to really love both Lucifer and Mark Pellegrino, but I'm super tired of both characters. I do think they seemed to be heavily foreshadowing killing off Mary, although it wouldn't be the first time the show has acted like she was killed off screen only to have her actually be alive. Actually, that whole final scene with Mary and Jack was frustrating, because Mary had just seen Jack brutally kill Nick, and Jack was clearly about to lose it, and I feel like Mary is smart enough that she should know the smart thing is just to say whatever Jack needs to hear until she can get out of there. She was with Jack in Apocalypse World, so she knows how powerful he can be. I think she was trying to not upset him with saying how much she cares and that he's family, but she didn't want to lie to him like she's done with the Winchesters, like this is her chance to raise a third son right. I think the writers set off too many branching stories last season and tried their best to tie them together this season, with an eye that the show will just keep going. Now that we know they're wrapping up next season, maybe we'll see a more cohesive final one. I'm in the camp that I don't think Lucifer is gone for good, but I also want him to be, since it's a huge breathing room to give to the show and allow all the other plots to finish up next season. 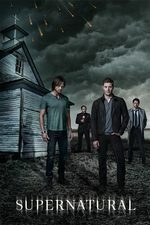 Like the promise that the Empty made to Castiel is a good twist for next season while Jack being the mcguffin big bad. - In 14.11 Damaged Goods, Sam tells Nick he can "burn" for all the death and pain he's caused. In this episode, Jack kills Nick by burning him alive, from the inside out. - Mary says Mouse Trap!, the board game, is Dean's favorite game when he was a child. - It is revealed that God is the only one that can restore a soul. - Nick: "Come on, Sam. Nobody stays dead anymore. You know that." A meta reference to the fact that many long-thought-dead characters have made reappearances on Supernatural in recent seasons. Also, it references the fact that characters in general tend not to stay dead.